The Chadron FFA Chapter was represented well on Wednesday, November 15, at CSC where members competed in different speaking events. A big congratulations goes to our three state qualifiers: Hunter Hawk, who was district champion in Senior Public Speaking, Jake Lemmon, who was district champion in Employment Skills, and Renee Redfern, who placed second in Cooperative Speaking. The team of Dadrianna Serres, Pamela Fisher, Garrett Glines, and Billy Tidyman was just short of qualifying for state, placing fourth in Ag Demonstration. In the Creed Speaking contest, in which first-year members recite the FFA Creed and answer questions, Emma Cogdill received a purple ribbon and Teagan Tidyman received a blue ribbon. Lance Cattin stepped up and competed in Extemporaneous Speaking, receiving a white ribbon. The Chadron FFA Chapter is off to a great start and we are looking forward to having many more members qualify for state. Have you noticed the yard signs that have been appearing throughout Chadron? Would you be interested in supporting this nonprofit effort to promote cultural respect, civility & acceptance? 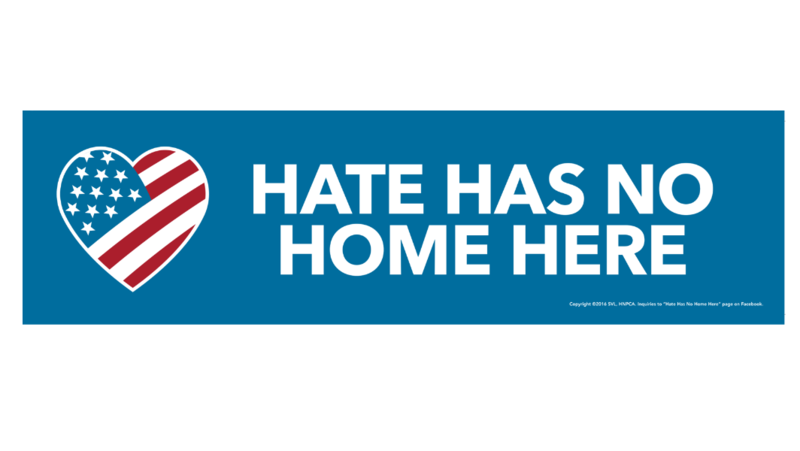 The 2-sided, weather resistant yard signs say Hate Has No Home Here in 7 languages: English, Lakota, Marshallese, Karen (largest refugee population at Job Corps), Amharic (language of Ethiopia), Arabic and Spanish. They are being sold at-cost, which is $7.50/sign w/ stand or $6.50/sign only. Text Cheryl Welch at (308)432-3519 or email loswelchitos@gmail.com for questions or to reserve a sign or two. We have had to place a 2nd order and they should be available by the end of the week. If they arrive soon enough, I will have them with me on Friday. Otherwise, I'm planning to sell/distribute them at the Bean Broker this Sat 11/18 from 10 am - noon. We are also encouraging individuals to purchase signs for their place of worship, business, school or public places. 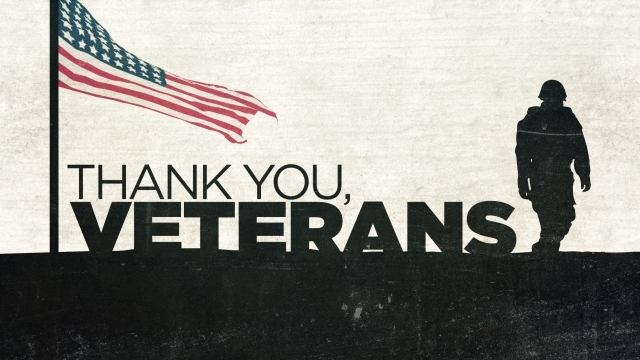 Donations to help provide yard signs for families who otherwise couldn’t join this effort are also being accepted. Help us show that Chadron is a community which supports DIVERSITY & ACCEPTANCE. In Advanced Biology we are learning about amphibians. On Thursday, November 9th we completed a frog dissection. This dissection allowed the students to get a better understanding of the frog's anatomy. 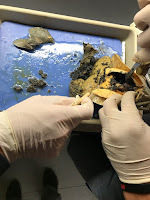 In this dissection the students had to locate and remove certain body parts in the frog such as the liver, heart, lungs, gall bladder, and fat bodies which are spaghetti shaped structures. 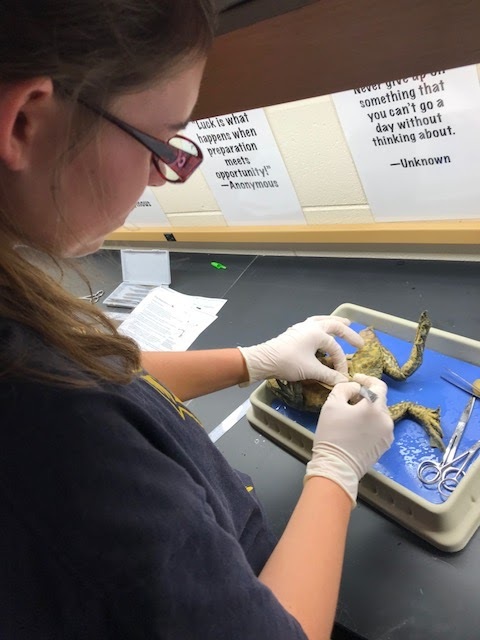 The first step in this dissection was to measure the frog and then compare that measurement to the rest of the class to get an average, our class average was 16.02 centimeters. 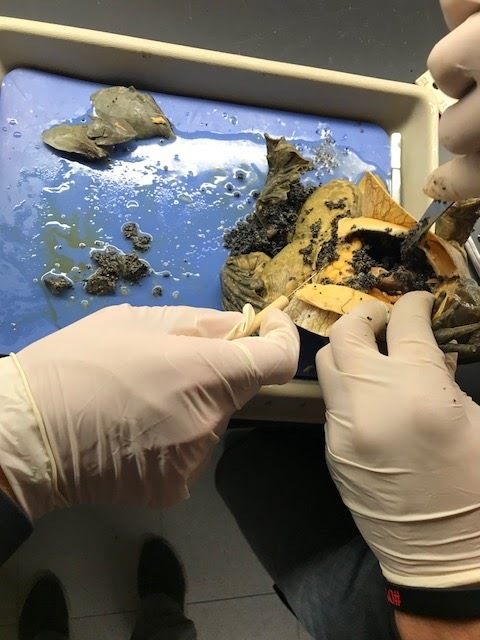 The first cut we made was through the abdominal muscles when we made a large incision on the ventral side, the underside of the frog, if the frog was a girl there were hundreds of small black eggs lining her stomach. After removing the eggs from the female frogs the organs were then visible. Some interesting facts about a frog that people don’t know are their tongue connects to the front of their mouth, they do have teeth, and also they have eardrums on the outside of their head just a little bit behind their eyes. By locating and removing the organs, the students learned where the internal organs are in relation to each other. 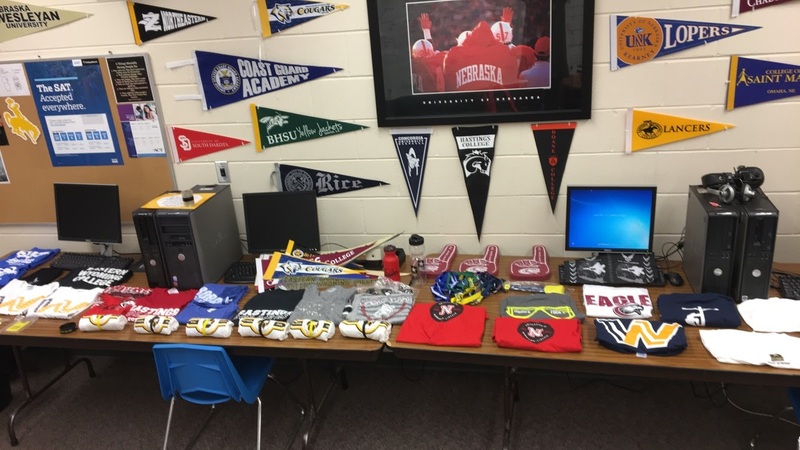 CHS Hosts - Apply to College Week! 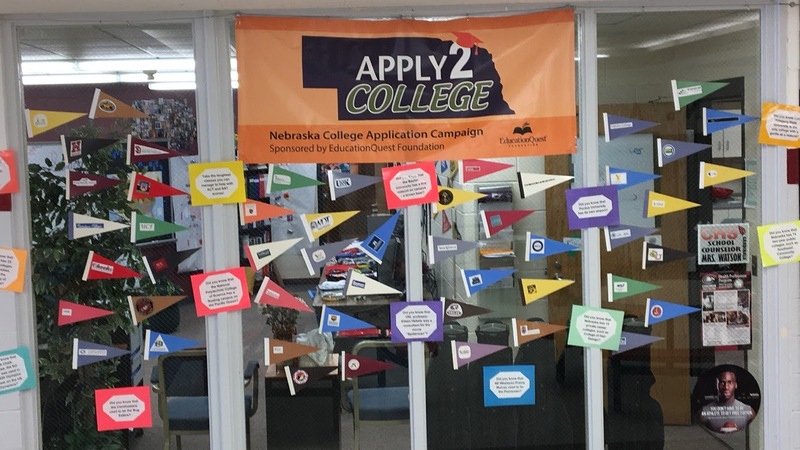 This week CHS celebrates Apply to College Week. On November 8th all seniors expected to graduate at the end of this academic year will be encouraged to apply for admission to at least one college or university. 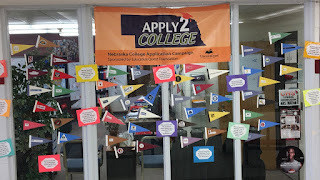 The purpose of this week is to acquaint students with the college application process and to communicate the importance of applying to college. Check out the list of events. Calling all Cardinals—students and staff!! Let’s play Blackout Bingo and win prizes! Come grab a bingo card from the main office window, on it, you will see 25 squares, each with the name of a different college. At least one CHS staff member graduated or attended that school. Ask any CHS staff member if he or she graduated from the square combination. If you find a match ask the staff member to sign his/her name across the square. Try to find all 25 matches—a blackout – for prizes that include t-shirts, water bottles, sunglasses, and more college gear. Turn in your card to the Counseling Office before 3:45 pm on Wednesday. Have fun talking with staff members about their post-secondary education! November 8th: Official visit of Chadron State College with ALL Seniors! 1:45 - return to CHS. November 9th: PRIZES GIVAWAY for College Bingo and College Trivia. Chadron Public Schools' classrooms are competing to raise money for the Circle of Light and the Future Healthcare Professions Scholarship. The Circle of Light is a program that gives financial assistance to patients diagnosed with cancer in our area. The Future Healthcare Professions Scholarship is a scholarship program for seniors interested in the healthcare profession. Both are aimed at giving back to our community. The fundraising challenge ends November 30th and the winning classroom of each school receives a Subway party in December! Good luck and thank you for supporting Change for Changing Lives!!! The Chadron High one act team will be presenting “John Lennon and Me,” by Cherrie Bennett, on Friday November 10th and Saturday November 11th. The play tells the story of a young girl who suffers from cystic fibrosis and has spent her life in a children’s hospital. It is a touching story of her battle with an incurable disease while learning about friendship through humor and hardship. Friday’s performance will also include a dinner theater, which is served from 5:30 PM-7:00 PM by the Cardinal Singers. 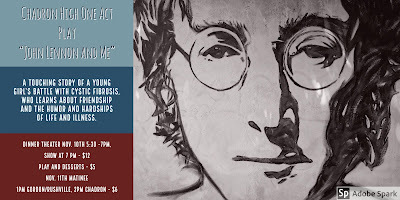 For $12 individuals will be served a chicken noodle casserole, a side salad, rolls, a drink, and dessert, and receive entrance to the performance of the play. Tickets are available at the door or in advance from any cast member or by calling the high school office at 432-0707. Saturday’s performance of the play will include a performance with Gordon-Rushville, where both schools will be critiqued by judges as they prepare for district competition. The plays will begin at 1:00 PM and 2:00 PM, respectively, in the auditorium. The cost is $6. The cast and crew will be traveling to Gothenburg this year on December 1st to compete at districts.